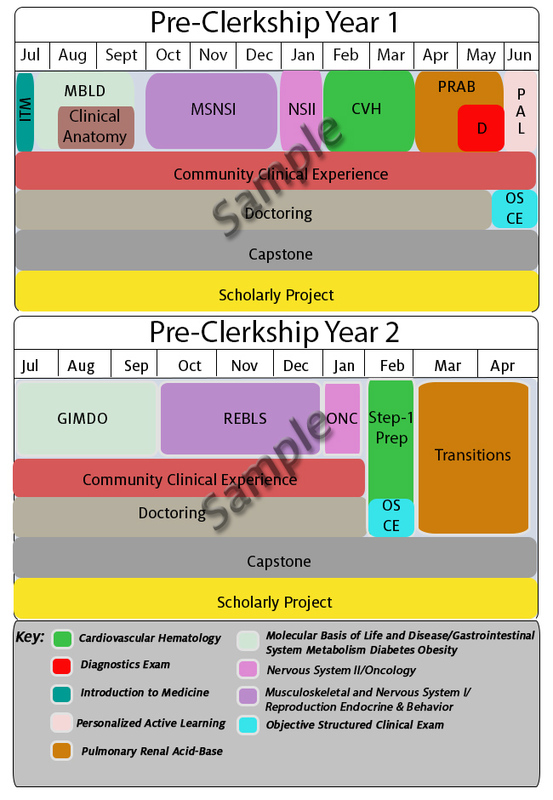 Blocks – The 12 pre-clerkship organ systems based blocks (Years 1 and 2), along with four longitudinal courses, comprise the pre-clerkship curriculum. Each block is directed by a pair of accomplished educators: one a basic scientist and one a physician. This intentional pairing ensures that students receive current and critical instruction in the basic sciences, as well as relevant clinical application of the material in each block. Capstones – Capstones clinical experience weeks, which occur immediately following each organ system block, provide students with innovative and clinically focused observational learning experiences in hospital, clinic and laboratory settings, augmenting and reinforcing learning obtained in the preceding basic science block. Community Clinical Experience – The Community Clinical Experience course traverses the first two years of the college curriculum and is characterized by an ambulatory care preceptor hosting a student in his or her office one afternoon, approximately every other week. Doctoring – The Doctoring course prepares the preclinical student to be a functional member of the medical care team by instilling the necessary skills for success in the clinical setting. Students will be proficient in history taking, using Patient-Centered Interviewing techniques including emotion seeking and emotion validation tools. Physical examinations will be efficient, technically correct and problem focused. Documentation skills will be developed to promote concise, precise, valid entries into the medical record. Critical thinking skills will be formed to enable the student to develop both broad and then focused differentials based on the standardized patient (SP) presentations. Longitudinal Curricular Themes – While each curricular unit targets specific and sometimes unique learning objectives and experiences, we have constructed a number of ways to provide seamless and cohesive content, bridging opportunities for students across the entire curriculum.